Back in July, the Sainsbury Centre for Mental Health published a report that highlighted severe failure to treat dual diagnosis prisoners – the many inmates with both mental health and substance misuse problems – and pointed to under-resourcing of inreach teams. And what’s this in the news this issue..? Another report from the same source highlighting the same problems and pointing out that they are being ignored. Do we really wonder why prison overcrowding has been getting worse all year? We always want treatment to be evidence based. But there’s an awful lot of evidence we choose to ignore. This year saw in-depth reports released from newly set-up groups as well as familiar organisations and treatment bodies who care deeply about influencing a new drug strategy. A wider public health approach has been underlined many times and must surely be taken on board – and that needn’t conflict with existing strategy. As our letters page underlines, there are many conflicting views on preferred modes of treatment – but the common theme that unites is the need to give each individual the best chance of recovery, ie a healthy life integrated with society. 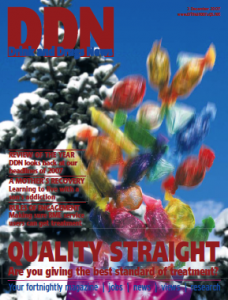 Nick Barton takes the lid off quality in our lead feature, as well as giving us an excuse for a Christmassy cover. (And a further excuse to eat a box of chocolates while taking the photo.) Is your service providing the standard of treatment you would give your own relative? A self-audit can be tough, but Nick’s five assessment parameters can help. It’s time for our Christmas break! We publish DDN again on 14 January, but in the meantime we’re here for all your letters, articles, adverts (which can still go online) publishing jobs and service user conference enquiries, so stay in touch! Season’s greetings to all our loyal readers and advertisers – see you in 2008.